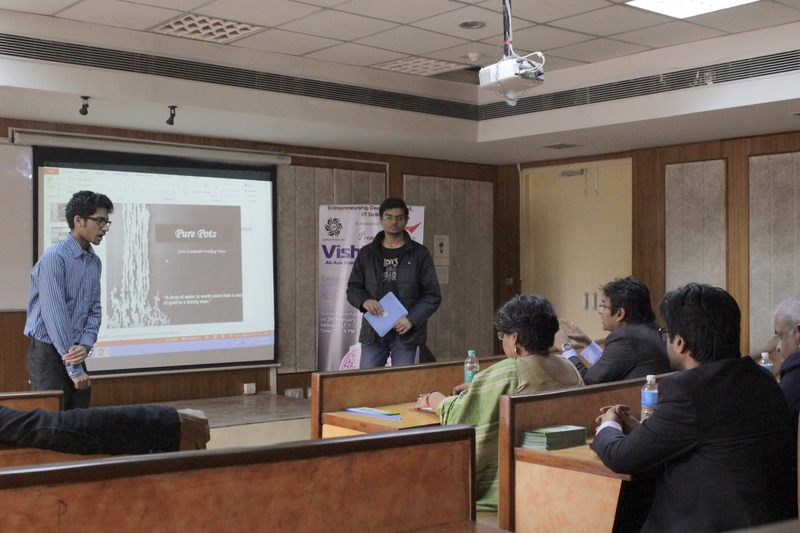 The Entrepreneurship Development Cell (eDC) – IIT Delhi, in association with Dhruv Forever, organized an exhaustive and exceptional Business Plan Event, “Vishishth – An All Asia Business Plan Competition 2014” with 2 sectors, namely “Social” and “Technical”. 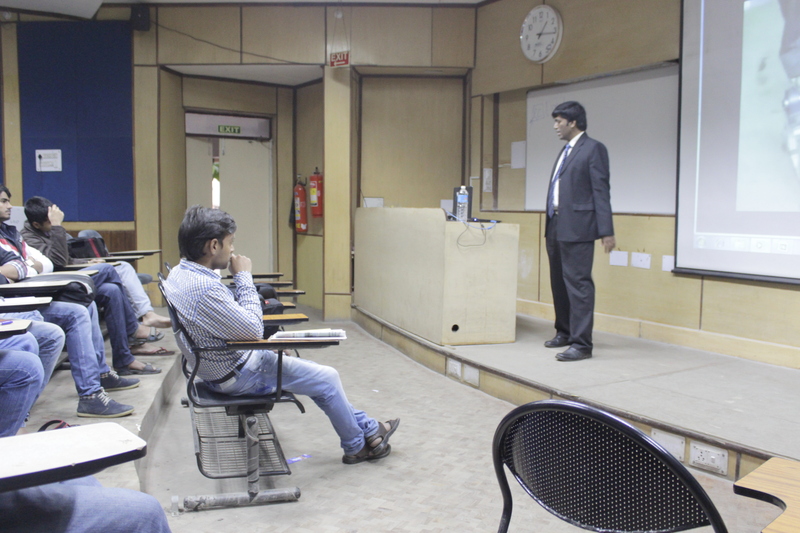 The event spanned over a month, receiving over 100 entries in each sector and IIT Delhi hosted the finals for the Social sector on Thursday, February 27th. The finals for the social sector witnessed 10 short-listed teams judged by an expert panel comprising Mr. Ashu Agarwal, Akansha Bapna Ma’am, Mr. Atul Law, Mr. Sanjay Gupta, and our proud sponsors Mr. Manoj Jain and Mr. Abhinav Jain, of Dhruv Forever. The event had certain strict time limitations where the presentation window was kept open for 10 minutes and another 5 minutes for the Question & Answer Session. 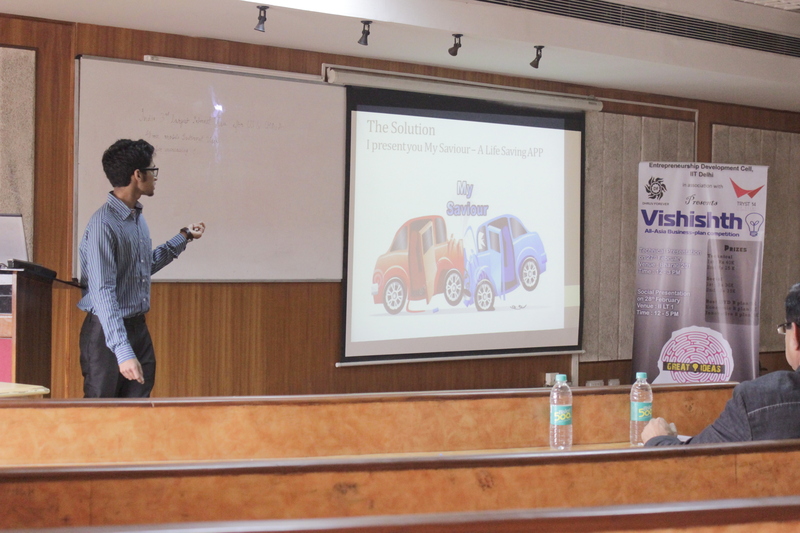 The event commenced with the presentations of the shortlisted finalists and the first team to present was the team “RavGins”, from IIT Delhi. The idea of the team is to get down the number of road accidents’ victims with a real time application which would work upon the accelerometer of the phone and provide a real time data to the nearby hospitals in the state of any mishaps. The second team “Knight Riders” presented an innovative idea: PurePots, to provide clean drinking water. Indeed a novel idea, they talked about the need of potable water, and presented another much elaborated technical model. The third presentation was about an education project, presented by “U2D” team. They emphasized on having a pool of faculties who could be a guest lecturer, or freelance teacher, but can’t dedicate their time solely towards it. Though, a new concept and nice idea, but the team seemed not to have a concrete base so as to tackle the financial hurdles. The next presentation was given by the team “Hansraj College”; they talked about the Clay Coolers, a low cost refrigeration technique fragmentally popular in the rural areas of India. The presentation was focused, primarily, on the poor and villagers as providing low cost refrigeration unit and along with a direct employment opportunity for the potters. 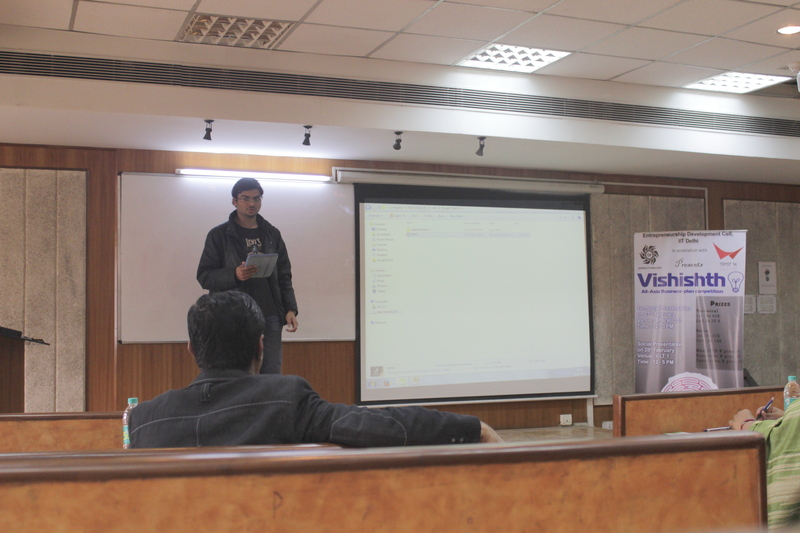 The fifth presentation in the series was given by the team “Integrated Utility App”, again from IIT Delhi; they talked about the reforms in the agricultural sector. The team went ahead by giving the facts about the present issues associated with the irrigation facilities, a well drafted and fact-full report. The team had the idea to automate the process of irrigation which could be initiated by just a missed call, i.e. not a necessity to have a smart phone. This team had attracted the interest of the judges the most, which was quite apparent with the reviews and remarks put forth. 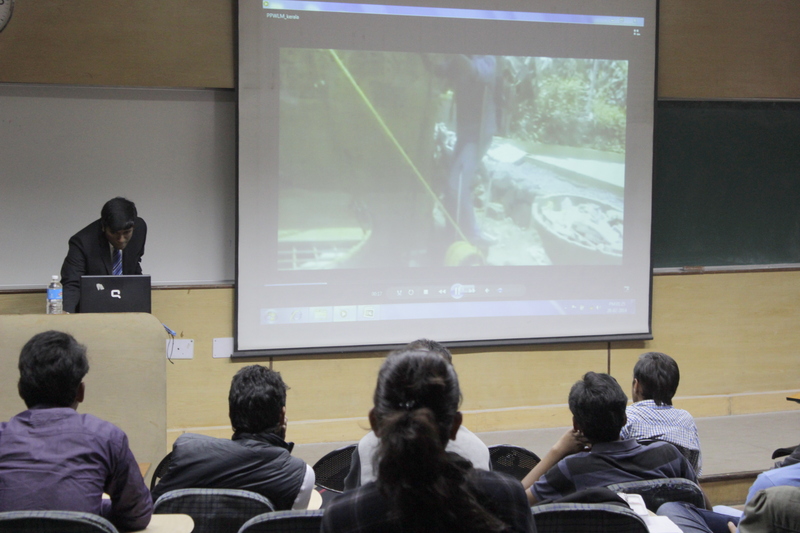 The next presentation was given by the team “Green Ninjas” from Delhi Technological University. They had their plan chalked around their Minor and Major projects, as the part of their Bachelor thesis, as “Bio Gas Digester”. Though this has been designed and is operational from quite a long time, but the thing that makes this team distinctive from the rest is the efficiency of the digester and their innovative and appealing customer outreach program. The next up in the series was team “Sanrakshak” from IIT Delhi; they touched the very base of the new and developing Indian cities, i.e. the unemployment. They articulated the formation of a circular chain wherein by providing technical and soft skills to the unemployed and uneducated, they could man the technical man-force to cater to the services of people in the middle and upper class. The plan has the 2 way approach, where one is to have own service centre, and other to act as a recruitment firm to provide manpower. It was team “Beginners”, founded by the SRCC graduates, who presented next and they essentially laid out their plan on providing the artificial limbs. It was a well drafted presentation with a professional cliché. With all sorts of financial analysis and professional aspects, the presentation seemed more like a VCs pitching session rather than a B-Plan event. The next up, it was “Skilldodo”; they presented a presentation with an IIMA graduate (with more than 25 years experience) on board. They emphasized onto providing skill development sessions to the rural youth in the specific areas such as Renewable Energy Sources, for it would be in one way providing employment and on other hand creating an impact about renewable and other sources of energy to the very root of the population i.e. villagers. The last presentation in the series was by given by team “Zeal”; they have an awesome and phenomenal idea which essentially emphasizes onto capturing the carbon that might have been trapped in the smog air (CO2) coming out of the machines. Despite of having an amazing and brilliant environmental and social idea, they could not convince the judges of their idea and skills. Nonetheless it was a great experience for the team, and they had a brilliant time exploring the different presentation skills, as reported by one of the team member later. There was indeed intense competition amongst the teams and it had the judges worrying a bit, for arriving at a decision regarding the declaration of results. The Results of the event will be released on 28th of February, 2014, after the conclusion of the finales for both sectors. The event then concluded with the anticipation for the finale of the technical sector which will be held on Friday – February 28th with a brief thanksgiving speech, and a token of appreciation for the judges and the organizers. 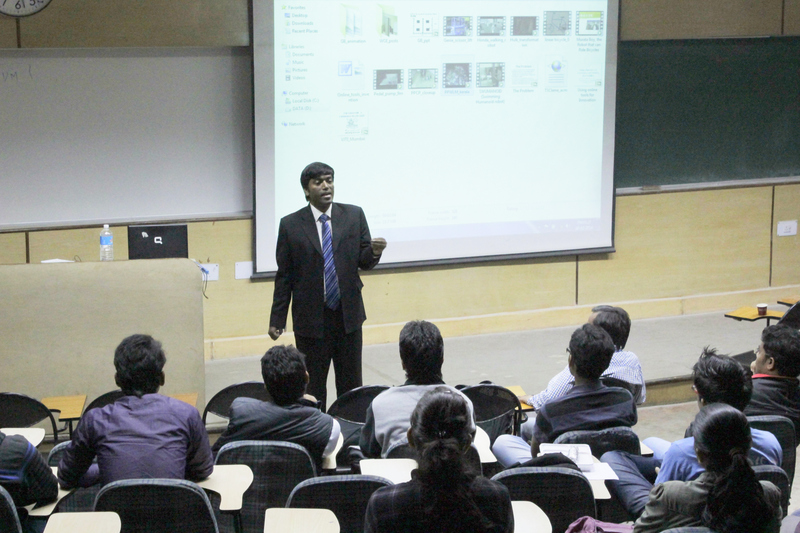 The morning of the 1st of February, 2014 saw the advent of imminent personalities in the field of design planning and innovation in Seminar Hall, IIT Delhi. The event began with a cheerful & pleasant host Vageesha, who worked as Project Manager in Clicklabs which was the host for the conference. The event had its first speaker as Mark Watson, Director at Design Providence and a Co-convener Indo-Australian Design Research Alliance (IADRA). Design Providence – a multi-disciplinary practice in the field of Interior Architecture and Product Design, founded in 1990. He has been working at Service Design and Design Thinking since 2010 and has become a partner with Amsterdam based Design Thinkers Group and Academy in 2013.He covered areas on Design Driven Innovation And Design Thinking. Mark, with over 30 years of experience in Design emphasized the importance and value that such experiences play for innovation and innovative thinking. Talking about his brainchild, IADRA, a project across the entire design area and the DT (Design Thinkers) Academy is a simulation of Design world through problem based learning which counteracts against the difference between Traditional Academics and design thinking. He stated that the idea of “design innovation” isn’t actually an oxymoron as everyone believes, against the common notion that design is done for the sole purpose of improving on the already existing ideas – design can actually lead to new projects. 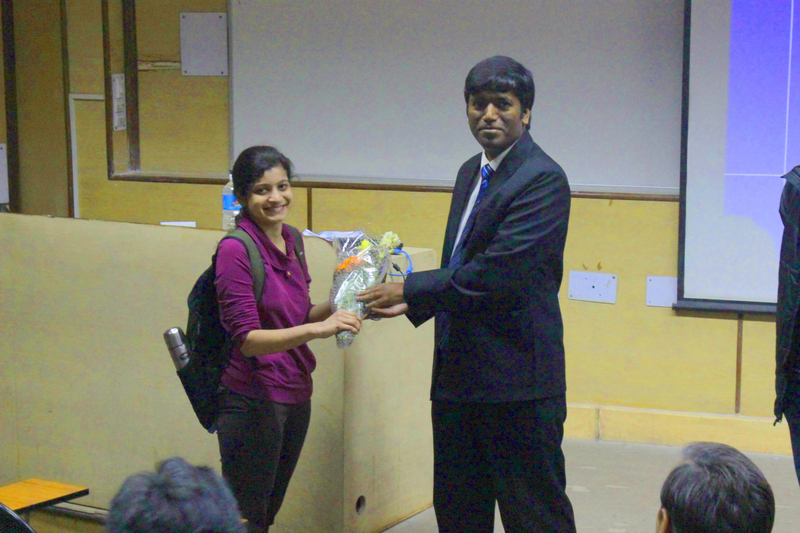 Moving on the next speaker was, Rumy Narayan, Sustainability Expert at Digiqom. Digiqom, an initiative that is focused on co-creation of the convergence of mobile Internet access with intuitive social media tools and enabling enterprises enhance their digital presence via Social content management, on mobile and on-line game based social conversions and brand community platforms. Also to say, the roadblock for designing is the generation of large waste from smaller inputs which is a challenge considering that there is limited space on the earth. She maintained that the sustainability challenges viz. Ecosystem destruction, increasing inequalities and the decline in natural resources, could be ejected out with the individual involvement since everything and society, as well, coexists. In her words design opportunities follow the ideology of cradle to cradle parody that something which is good for us may not be the same for nature, like in biological nutrient cycle the grains that we eat, are essentially the plants’ waste. The next speaker, on the rolls was Gautam Malik, Head of Design and Creative services at Jabong.com, a passionate design leader with a drive for building great teams and world class products. He has over 14 years of experience helping organizations successfully launch new ideas. In his role as Head of Design at Jabong.com, he is currently working towards making Jabong India’s top fashion destination. His agenda for the day was “Designing for New India” and his presentation looked more like a medical textbook than a gripping power point sideshow, to which he himself remarked that his aim wasn’t to gratify the viewers. He proceeded his talk in 3 sections, namely contextual analysis, complications and factors that could influence the design thinking and growth. He pointed the pursuit of Indian economy which is predicted to be world’s largest by 2050 and began to chalk out the complications which included the political scenario, environmental costs and investment guarantee. He, in his own words, describes himself as having the mind of an architect, the heart of a filmmaker and the hands of a designer. The fourth speaker of the day was Rajat Tuli, co-founder and CEO, or as he rightly calls himself, Fire fighter at highly successful online shopping portal, Happily Unmarried. He won the Young creative entrepreneur award for the year 2008, awarded to pioneers in the creative industry. The very first and a critical point he mentioned was that the sequential order for coming out with a good product or business idea, which is Need → Idea→ Business and not the vice versa. His talk involved the idea that everything must be tuned in sync to create the greater harmony for the business environment, be it marketing, sales, or even back-end profile. He especially remarked the idea of showcasing, for which as a matter of fact is the key to have larger shares in the consumer sector, consumer connect, and believing in yourself. Up next was the very enriching presentation by Mr. Girish Lakshaminarayana, Founder at FastCandidate.com, CTO at Dealsandyou, and CTO & Co-Founder at Klea Global. Having worked with half a dozen top companies in past, he currently runs a startup called AttendMind which helps companies manage attendance and leave better. He spoke about how to apply age-old design principles and the new design mindset to create great products. Thereafter, the event had the privilege to hear Gautam Mahajan, president customer value foundation and a global thought leader in Total Customer Value Management, followed by Ishan Khosla, the principle & founder of Ishan Khosla Design, and Anuj Bhargava, Co-Founder & Chief product officer at Appiterate. Design, in the opinion of the speakers should be tested of its capabilities with the questions of the sort such as, feasibility, misfits, customers’ perspective, etc. Design also to hit the customers’ choice must be simple and intuitive so plan out so as to, remove, hide, organize and displace some or other things to prepare the neat and consumer specific product. With a short thanking note to speakers, sponsors and organizers, the event, then, concluded delightfully with the enriched and mind-boggling thoughts and life stances of our dignified speakers. It’s Just A Business, or is it? As an entrepreneur, whenever you think of the word “business”, whats the first thing that comes to your mind? Money? Fame? Or is it hours of toil and sacrifice? Well, when asked the same question, Mr Jobs had said “The first thing that comes to my mind is my identity!” Is there anything more personal than your work? Your money, your blood, sweat and tears? Your time away from those you love? We are not robots, we are humans — at least most of us. We need to bring (more) humanity back into our work and business, don’t we? As an entrepreneur, you’ve probably felt the sting of rejection a couple of (thousand) times. I don’t care how thick you say your skin is; rejection can take it’s toll on you and cause you to get stuck or give up. So maybe avoiding it or “not taking it personally” all these years is your defense mechanism? I get it. But we might need to reframe our perspective. It’s fine to acknowledge that there are those who will seek to shame you. But that doesn’t mean you have to accept what’s given. We don’t work for the applause, and we’d be foolish to read the anonymous comments on Amazon or the tweets coming from the back of the room. That attempt to quiet you down and make you conform doesn’t belong to you unless you want it to. The tricky part of what Godin is saying is the understanding of how to be more vulnerable and exposed without feeling shame when critics hurl daggers at you. It is the secret to both dealing with rejection and unlocking your ability to do amazing things. He says: “But if we allow shame to be part of our vulnerability, we allow it to destroy our work. It’s impossible to do art with stakes that high. You can’t say, ‘If it works, fine, but if it fails, I’m shamed.’ The only way to be successfully vulnerable is to separate the results of your art from your instinct to feel shamed.” And that’s possible, because while someone can attempt to shame you, shame must also be accepted to be effected. We can’t make you feel shame without your participation right? Blame yourself, surely! But that has to be devoid of any specs of shame. So after all this, is it so personal? You bet it is. And guess what, that’s a good thing! What drives people to take up entrepreneurship as a way of life? ‘Entrepreneurship’ – does this word arouse a sense of curiosity or individuality, or some random thought which secludes you from the rest? What exactly is that notion that one gets, and might lead them towards setting up a multi million-dollar firm? This thought has been a point of debate for the curiosity seekers, and all through the entrepreneurial circuit. An observant and thinker – Who can spot business opportunities to fill up the gapped space. Strong-hearted and a risk taker – Market is unpredictable, you’ll have to, at times, take risky chances. Resilient – Must learn from the mistakes and move on, this is the key to success. An opportunist – Grasp whatever you’re offered. Enjoys it as a way of life! Coming towards what drives the sense of taking up the entrepreneurship as a way of life, hoping the definition for an entrepreneur is digested, there are certain formulas, or say mantras for this! Which says there is nothing that is required to have a similar stint. The thumb rule also debars the restriction for age and limits only to have an idea to drive the society and market. Jeno Paulucci, the master chef, presents an unprecedented example of this and serial entrepreneurship, with more than 70 companies to his credit, including the major frozen-food brands, and at 89, he’s getting on foot to launch another new venture! And did I mention Lizzie Marie Likness? Oh well, she is 11 and is already running a health and living business that deals with healthy cooking recipes, and is being endorsed on WebMD with a Fit Channel series, “Healthy Cooking with Lizzie”. The two examples hence clears crucially that age is not a limit, just have an idea to cook up and that’s what one got to have to pursue entrepreneurship. Present era has been witnessing the series of innovative business ideas to take roots and rule the world, and has made a similar atmosphere for innovative thinking even at the school level. Children growing up bewildered from the nature’s charm and societal pressure, develops the habit to innovate and think sneak away routes towards the positives of nature and this very sense drives them towards entrepreneurial stint. Having the habit to innovate and think, and living the world opportunistic, let open the stream to inculcate the ideas. And if one has the idea, the thirty percent of work is done. A good example could be the case of siblings Shravan Kumaran and Sanjay Kumaran, who are as of now the youngest innovator and entrepreneurs. Shravan, 14, the president and Sanjay, 12, the CEO of Go Dimensions, an app development unit founded over 2 years back in their bedroom, shows that there is no bar for innovators, and innovations starts from the root i.e. oneself and don’t require high-fi simulation laboratories and is not limited only to the elite exclusive degree holders. Being an entrepreneur, one also gets to have the personal space which is quite often not there with non-entrepreneurs. This is also the major aspect that fuels the thought of entrepreneurship, considering one gets to have them design their schedule, on their own as they wish. There is no compulsion to work, but the desire, and this attitude gives a sense of relief and satisfaction even if they somehow end up spending the whole day working upon the idea. Breaking the general convention that only engineering and commerce students innovate and take up entrepreneurship as a way of life, I would like to name Anita Dongre, who has far from even miles relation with the above fields of study, launched her brand, a milestone for her, and went up thereafter launching a couple of more such fashion lines. This presents the unlimited scope and diversity entrepreneurship offers. Working even in the world’s richest firm may not relieve you off the societal desires and peer pressure, there always seems to have expectations in one or other form. But taking up the entrepreneurial life one gets relieved of the headaches for the promotions and other materialistic charm of working for someone, but is free minded and is led by the thought of doing and achieving something great. And this very thought fuels them until the success is experienced and relived. Coming towards the conclusion, I’d like to have compiled the essentials that drive one towards entrepreneurship. Open Atmosphere, giving opportunistic view. Personal Space, time for the precious moments of life. Independence, Boss of your own. No headaches for promotions, write your destiny. No conventions, there is no prescribed route. Adventure, explore your hidden self and of the world. Satisfaction, for there is no compulsion to work but the Desire! So, Have an Idea? Don’t look work upon it! Covering the essentials of what drives and fuels the thought process to take up entrepreneurship and pursue it as a way of life, the article and the writer wishes to have you delightfully filled with all the sensible abilities to work upon a scratch, scratch that needs to be refined which once completed, let you relive the best of your joyous moments of life, Entrepreneurial life – the journey. The new GE: Google, everywhere! AT GOOGLE they call it the toothbrush test. Shortly after returning to being the firm’s chief executive in 2011, Larry Page said he wanted it to develop more services that everyone would use at least twice a day, like a toothbrush. Its search engine and its Android operating system for mobile devices pass that test. Now, with a string of recent acquisitions, Google seems to be planning to become as big in hardware as it is in software, developing “toothbrush” products in a variety of areas from robots to cars to domestic-heating controls. Its latest purchase is Nest Labs, a maker of sophisticated thermostats and smoke detectors: on January 13th Google said it would pay $3.2 billion in cash for the firm. Google’s biggest move into hardware so far is its $12.5 billion bid for Motorola Mobility, a handset-maker, in 2011. In recent months it has been mopping up robotics firms (see table), most notably Boston Dynamics, which makes two- and four-legged machines with names like BigDog and Cheetah that can walk and run. Google’s in-house engineers have also been busy working on driverless cars and wearable gadgets such as Google Glass. Nest takes Google into the home-appliance business, which is how another, much older American conglomerate got started. General Electric (GE) produced its first electric fans in the 1890s and then went on to develop a full line of domestic heating and cooking devices in 1907, before expanding into the industrial and financial behemoth that is still going strong today. The common factor shared by GE’s early products was electricity, something businesses were then just learning to exploit. With Google’s collection of hardware businesses, the common factor is data: gathering and crunching them, to make physical devices more intelligent. Why fork out so much for a startup that makes such banal things as thermostats? Paul Saffo of Discern Analytics, a research firm, argues that Google is already adept at profiting from the data people generate in the form of search queries, e-mails and other things they enter into computers. It has been sucking in data from smartphones and tablet computers thanks to the success of Android, and apps such as Google Maps. To keep growing, and thus to justify its shares’ lofty price-earnings ratio of 33, it must find ever more devices to feed its hunger for data. 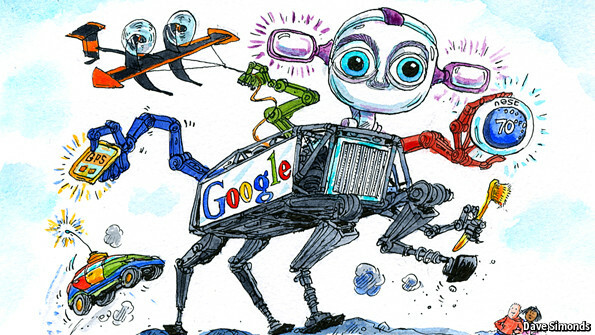 Google has said little about its plans for its new robotics businesses. But it is likely to do what it did with driverless cars: take a technology financed by military contracts and adapt it for the consumer market. In future, personal Googlebots could buzz around the house, talking constantly to a Nest home-automation platform. The challenge for Mr Page will be to ensure that these new businesses make the most of Google’s impressive infrastructure without being stifled by the bureaucracy of an organisation that now has 46,000 employees. Google has had to overcome sclerosis before. Soon after returning as boss, Mr Page axed various projects and streamlined the management. Nest is being allowed to keep its separate identity and offices, with Mr Fadell reporting directly to Mr Page. Google has also protected its in-house hardware projects, such as Google Glass and self-driving cars, from succumbing to corporate inertia by nurturing them in its secretive Google X development lab. It has also given its most important projects high-profile bosses with the clout to champion them internally. The new head of Google’s robotics business is Andy Rubin, who led the successful development of Android. Such tactics are good ways to avoid the pitfalls of conglomeration. But to ensure success, Google will need to avoid another misstep. Its chequered record on data-privacy issues means that Nest and other divisions will be subject to intense scrutiny by privacy activists and regulators. Provided it can retain the confidence of its users on this, Google should be able to find plenty of new opportunities in both software and hardware that pass the toothbrush test and keep a bright smile on its shareholders’ faces. 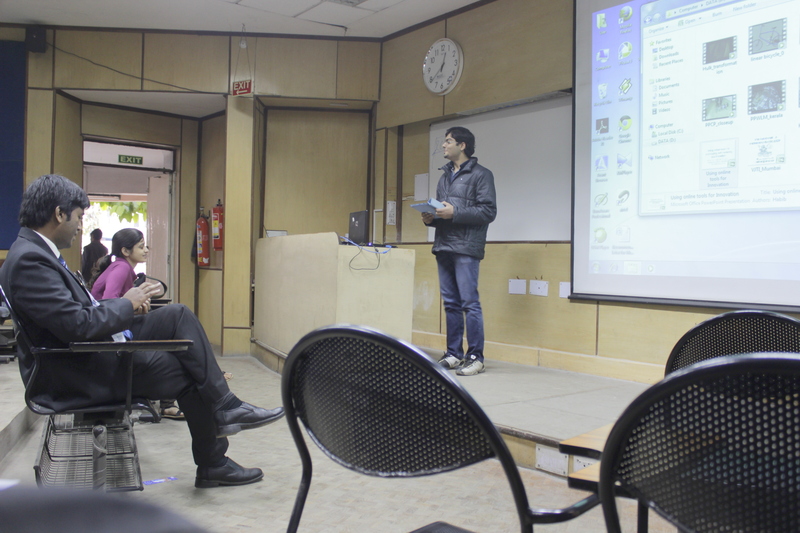 An event held by Amazon Web Services on 11th January in the Seminar Hall, IIT Delhi, it witnessed a panel of venture capitalists who were present to deliver their perspective on investment in the Cloud Environment and interact with an enthusiastic college audience. The panel comprised Mr. Anshu Sharma (Invests in technology-based enterprises, has previously invested in SnapChat, ITZ Cash etc. ), Mr. Rohit Jain (Invests in Consumer Internet Companies like MakeMyTrip), Mr. Sailesh (An early stage investor, having already invested in RedBus and MakeMyTrip) and Mr. Alok Goyal. On the issue of the industry of business opportunities the Aadhar Cards would give rise to, Mr Jain opined that his firm would not deal with the government. Mr Goyal mentioned that the Aadhar should give rise to a large market in the supply chain (e.g. Healthcare Industry). He also mentioned that the issue of business on the Aadhar platform has to be developed further. Most of the panel agreed that with the mobile penetration increasing, cloud storage was becoming cheaper, and the future technology would involve a lot of Mobile and Internet. Mr. Goyal aptly used the word “SMAC” to describe the future technology (“SMAC” – Social Mobile Analytics Cloud Storage). Mr. Jain mentioned that the combination of cheaper internet services, cloud based storage and analytics will give rise to new virtuous business cycles. Mr Shailesh however was more generic in his response mentioning that the future would have any technology which would solve a currently existing problem. All the VC’s agreed that Cloud has affected the scalability of businesses. They also mentioned that Cloud has changed the way in which people conduct their business. For example, Mr Shailesh, citing the examples of Dropbox and Evernote, mentioned that such applications were initially designed to be consumer applications; as they became popular, they were marketed as Enterprise Applications. Mr Alok mentioned that Cloud has changed the Development and Release Cycle. On the very important issue of VC’s having a soft corner for Entrepreneurs coming from Accelerators, Mr Goyal termed the accelerators as “branded proxies”. He mentioned that the accelerators increased the opportunities to establish “connections”. Mr Jain mentioned that the accelerator ecosystem in India had a long way to go before it became mature. All the VCs were of the opinion that accelerators are not a necessity. Mr Goyal also advised nouveau Entrepreneurs not to lose their focus. Commenting on the mistakes made by nouveau Entrepreneurs, Mr Anshu mentioned that they often lacked vision. All VC’s also said that 1st time entrepreneurs should not be afraid of moving out of their “Comfort Zones”. All of them mentioned that one of the most important things that they saw in a company before investing was an already established “Strong and Passionate” team. 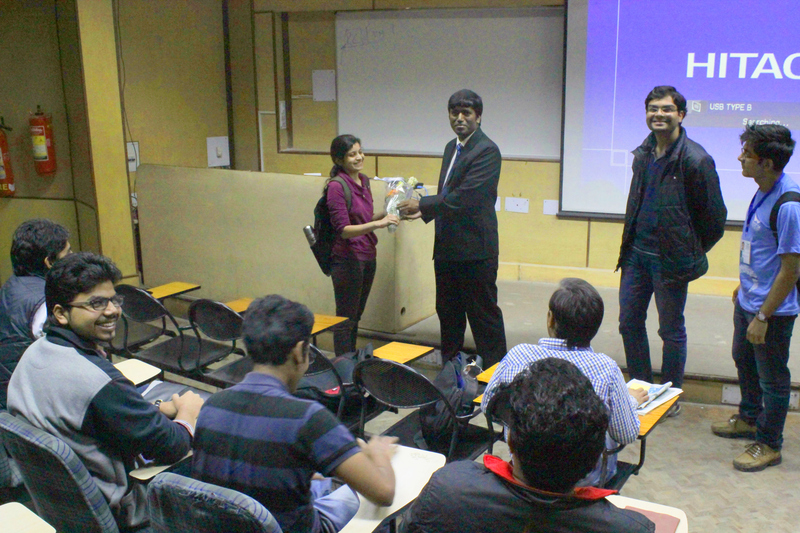 They also mentioned that the team members should ideally have “Complimentary” Skills. Responding to a question, Mr. Alok Goyal mentioned that India could produce a Google / Facebook and along with the Entrepreneurs, the VC Ecosystem in the country is evolving, for the better.